If you are what you eat...be magical! 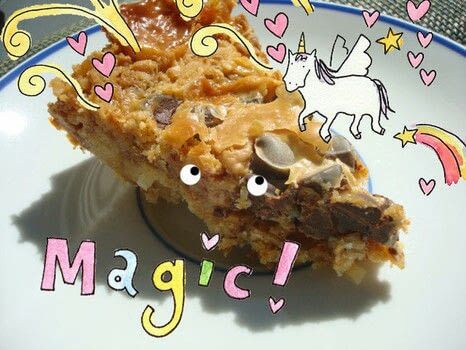 Magic Cookie Bars are, as their name might imply, no ordinary treat. Starting with layer upon layer of unrelentingly rich layers of buttery graham cracker crumbs, toasted coconut, chocolate and butterscotch chips, and nuts, they get even better from a rich smothering in sweetened condensed milk. With all that awesome, some might argue that a small serving is best. But I disagree, and to prove it, I've created it in a deliciously thick pie form. The peanut butter is not traditional in this recipe, but it is delicious. If you want to stay traditional, you can choose to use 1 cup of toasted pecans, walnuts, or peanuts instead. Preheat oven to 300°F. Butter a 9-inch pie plate. Put the graham cracker crumbs, butter, and toasted coconut in a pan over low heat until melted; stir until the mixture is cohesive. Let cool until it is still warm but not hot to the touch; using your hands, press the mixture into the bottom and sides of your pie plate. Refrigerate the crust for 15 minutes, then bake for 10 minutes, or until golden brown. Let cool for about 20 minutes before moving ahead. Increase the oven temperature to 325°F. Place the peanut butter in small even dollops across the bottom of the crust. Evenly scatter the chocolate chips and butterscotch chips on top of the peanut buttered crust. 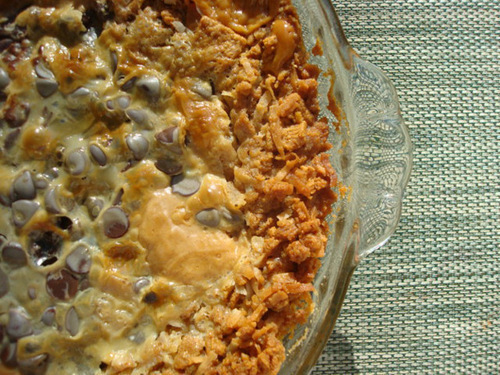 In a steady stream, pour the sweetened condensed milk over the filling. Gently shift the pan to make sure the milk has been distributed evenly. Bake for 30 to 40 minutes, or until golden brown and bubbly (mine was more like 40 minutes). Transfer to a wire rack and let cool completely. I found that chilling for an hour or so helped the filling set.